We lost power on Thursday morning, about 5 minutes after I gave my husband an anniversary card that said "Come rain or come shine, we'll be doing fine...as long as we have each other! (And electricity!!)" Geez! We were laughing ourselves silly until it came back on and we discovered that we had lost a TV, a satellite receiver, a DVD/VCR combo and a clock and a $10 lightbulb, from 3 different rooms. And it's all the same stuff we lost 20 months ago when Ike came whipping through and wreaking havoc. We stopped laughing for a while, it wasn't funny any more. Well, he fixed the DVD/VCR combo. We bought a new clock. (It didn't work, we had to return it, another trip to WalMart, 20+ miles away.) We ran all over trying to find a part for the TV- the capacitor blew out- we had to order one online. The satellite receiver is being replaced no charge. We have had no TV since Wed night. We are missing the last 2 episodes of Survivor, which is just MEAN. A friend is recording it for me, though, thank you LIZ!!!!! So, since we're leaving on vacation on Wed, we have to get as much of this stuff fixed before then AND clean the house and make sure everything is in order for our housesitter to stay here in comfort while we're gone. Sheesh, nothing is ever easy. The lawnmower broke, the parts place was closed, we're having monsoon rain storms, and the list goes on and on and time is of the essence! 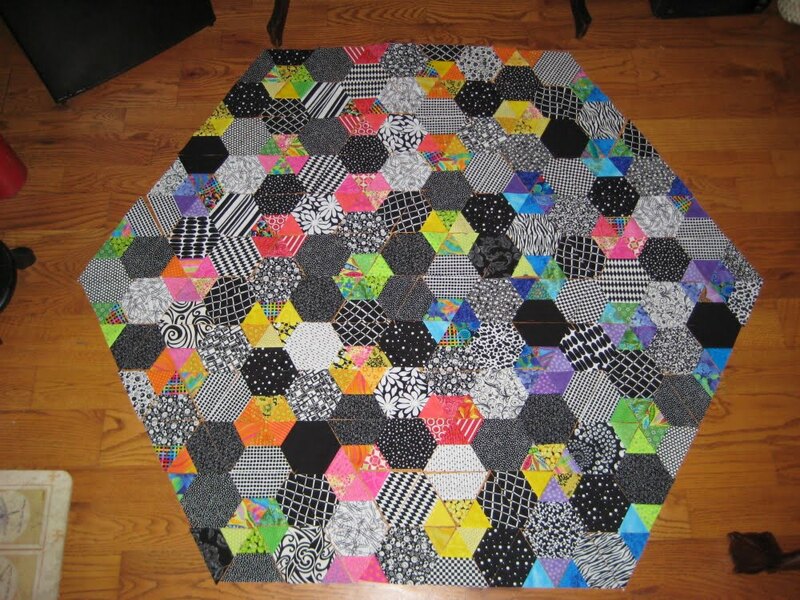 To distract myself a little, I've played this week with the layouts for both sides of my hexagon quilt. This side is mostly black. 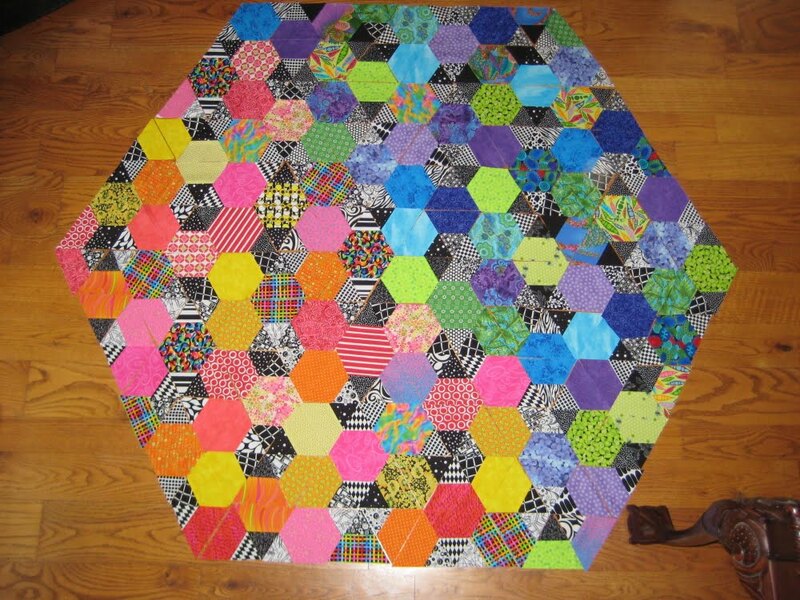 I arranged the mixed hexies to be somewhat orderly, by color, either greens or blues or reds, etc. I spent so much time on the floor getting up, squatting, bending, etc that I could barely move without moaning for 2 days afterward, man I'm out of shape! This side is bright hexagons with mixed blacks and whites interspersed. I arranged this side so the warms are on one side and cools on the other, but not divided straight up and down, a little looser than that. I locked the cats out of the sewing area so I didn't have to worry about them scrambling up my layouts, this took HOURS and hours to perfect, believe it or not. Anyway, they're all stacked, numbered and put up safely until I can sew all 430 triangles together! 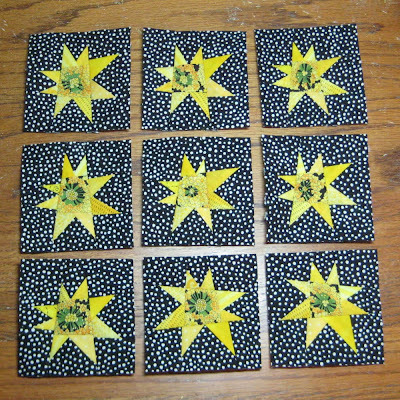 And here are 9 mini 3.5" quilt blocks for a swap I'm in. The challenge was black and white and one other color, I picked yellow. 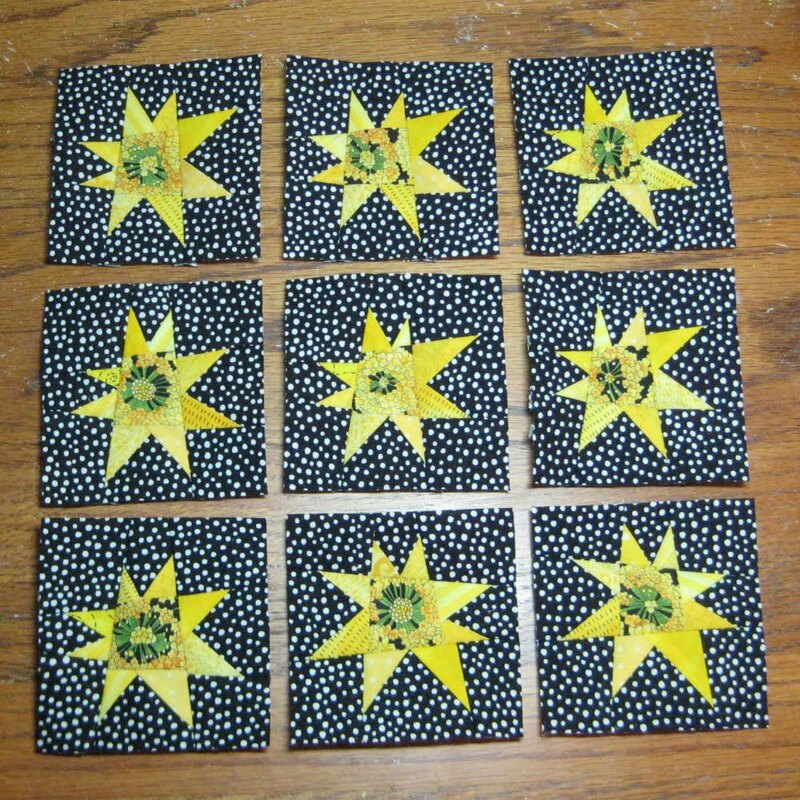 So I made wonky liberated stars and I think they look like nice little suns. I'll send 8 of them away and get back 8, each one black and white and one other color. Then we'll all assemble our mini blocks and make mini quilts! I also made a mini quilt for a new friend in CA, I'll show you that in another entry, it came out pretty cute, I think. Sounds like a bit of craziness, but hope your vacation makes up for it! Just love your hexes, especially the warm/cool arrangement! And your swap blocks are fab too! You are one creative girl!! Bloody hell, woman, what an electrical mess. Would surge protectors not ssve your audio/visual consumables!? Love your hexagons. They take some shifting about, don't they? I was an hour at mine tonight and am nowhere near a resolution. Yours looks great!! Oh that is horrible but I know the storms have been fierce so far this year. Hopefully the power is back so you can at least sew while the TV is kaput. Have a great vacation. 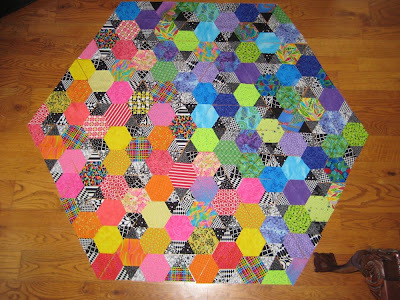 Love your hexies, especially the colourfull one. The colours just jumping out there!